My new furniture from Ikea came on the 5th of July. I had changed my furniture as I didn’t think I would need such a huge desk since I have graduated and am not studying anymore. What I truly needed was more storage space, especially since my mum relegated my pants, jeans and shorts to the non hanging position cause I got too much clothes. I still don’t think I have too much clothes, but since they are all folded now, I might as well get a drawer configuration too. My parents also got me a new desk chair which has better back support from the relatively-cheaper old chair that I used for some time. 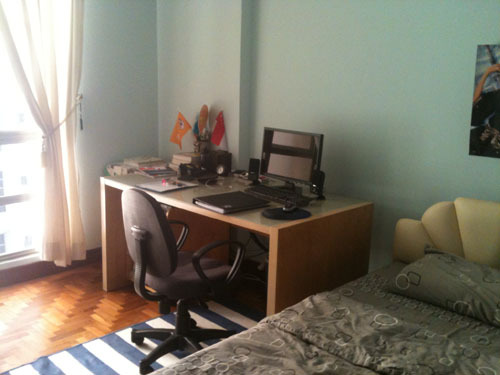 Here’s a photo of my room before the new furniture came. 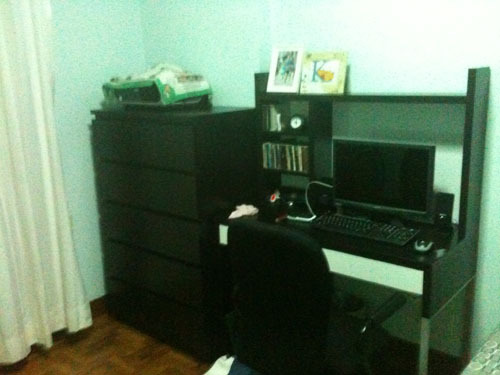 I had spent the entire late afternoon + night assembling the chair, the desk, the add on to the desk and then the drawer. It took so long cause mistakes were made and time had to be spent correcting those mistakes. The desk is much smaller in terms of the length and breadth, and I like how it has the add on where I can put my CDs and extra decorations. I can even put my photos nicely on the top. It did give me more room inside my room though. Perhaps one day I shall convert the remaining areas to some relaxing corner. I’m very happy with my drawer too, as there is more room for everything. It isn’t a very solid drawer as Ikea typically boasts of easy to assemble furniture that is cheap, and solid drawers require more wood and metal screws. I cannot put heavy stuff like my textbooks in, so I am going to reshuffle my book shelf and move the lighter books in. On second thought it is already 6th July so I’m going to work today YAY! Posted on July 6, 2011 by ignorantsoup	This entry was posted in General. Bookmark the permalink.